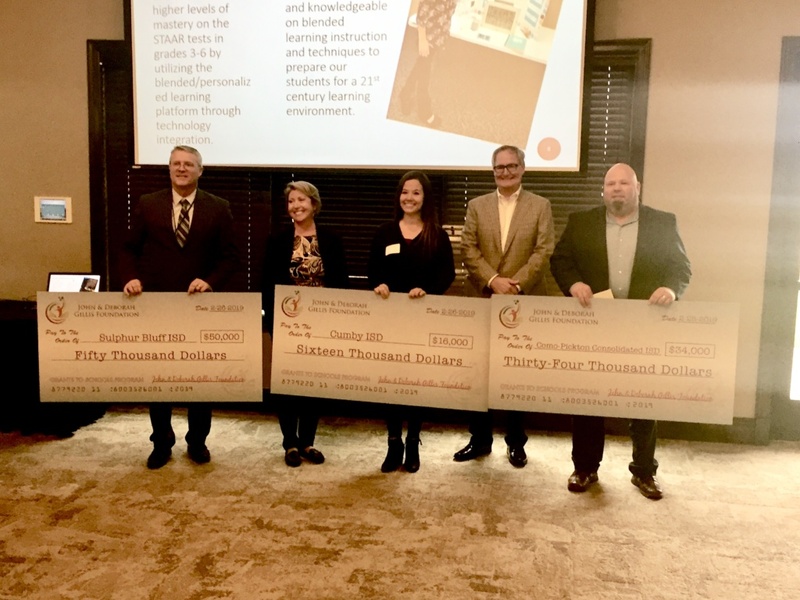 Congratulations to our 2019 Grant Winners! Three Hopkins County school districts were awarded a total of $100,000 in grant money Tuesday from the Johnny and Deborah Gillis Foundation in the first outlay of funds from the couple directed toward the improvement of education in their home county. Sulphur Bluff, Cumby and Como-Pickton school districts were the award winners in the Grants to School Program of the Gillis Foundation. In April, the foundation will name its 10 Bright Stars scholarship winners from among Hopkins County high school graduates. But on Tuesday, it was all about classroom instruction as the three school districts were recognized for developing programs that will significantly impact on-campus instruction. Johnny and Debbie Gillis, both Sulphur Springs High School graduates, were outwardly excited to be able to give such generous donations to help teachers reach students in new, innovative ways. He emphasized to all school districts in the county that the Gillis Foundation’s commitment is not a one-year pledge. Robin Shrode, executive director of the foundation and a life-long educator, said the grant applications were judged by professionals from out of state so there was no conflict of interest. The grant process also asked the school districts to spread the funds over three years. “What we’ve found is that a one-year pot of money doesn’t make the same impact as a three-year, thought-out strategic plan,” she explained, adding that school districts were also asked how they would sustain the program after the three-year cycle is over. The Avid support system will be implemented in grades six through 12 to engage students in rigorous and relevant learning experiences to prepare them for graduation and post secondary success. Cumby ISD was awarded $16,000 to increase the quality of student learning in the current Health Science Technology program and to offer certifications. “They are going to use their funding to increase the quality of curriculum already in place. They will purchase additional curriculum and put it in the classroom, particularly in the lab, which will simulate medical facilities, so they will have real life experience in the classrooms. It will be hands on for the students,” Shrode said. Cumby High School Principal Jennifer Dracos said administrators and the district nurse Juliana Osornio visited Kilgore, which has a similar program to determine the quality of instruction and value the real life experiences. Sulphur Bluff ISD was awarded $50,000 to introduce a blended, personalized learning platform through technology integration to maximize success for each student’s learning needs. By 2022, SBISD plans to higher levels of mastery on the STAAR tests in grades 3-6 by utilizing blended/personalized learning platform through technology integration. Shrode explained that blended learning is when students have information but then take it to a whole other level that they couldn’t do without computerized devices in their hands. “Sulphur Bluff also put a lot of money in their staff and professional development so that their teachers felt comfortable designing work and delivering lessons at a level that would truly change the lives of the students,” she explained. The next part of the Gillis Foundation’s commitment to education is the Bright Stars Scholarship Program, in which 10 graduates from Hopkins County high schools will be awarded $4,000 scholarships per semester, renewable for up to eight semesters, making it by far the largest single scholarship program in the county. The deadline for applications is March 22. Applications are available at all Hopkins County high schools. The winners will be announced in mid-April. Information regarding the process of applying for the Grants to Schools and Bright Star Scholarship programs are on the foundation’s website, www.jdgillisfoundation.org.